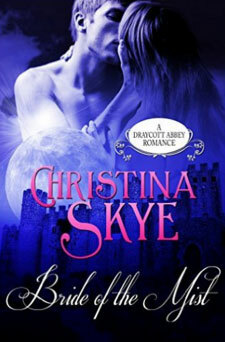 When Draycott Abbey calls bridal expert Kara Fitzgerald to help a man in mortal danger, Kara is helpless to fight the force of her psychic visions. But the man in question, security expert Duncan MacKinnon, has no time for vague warnings, even when they are delivered by a beautiful woman who knows far too much about his private life. Yet coincidences begin to pile up, and soon the rugged Scotsman wonders if this beautiful stranger could be telling the truth. Determined to find answers, Duncan sweeps Kara north to his castle where, veiled in the Highland mist, the two are caught by blinding desire. Strangest of all are their hotly sensual memories of being lovers … separated centuries before. Though it defies all logic, Duncan accepts Kara’s visions and her help to confront a boyhood tragedy. For her part, Kara needs Duncan’s strength to help re-awaken the eternal passion that will protect them as an old enemy stalks the crags of Dunraven Castle.